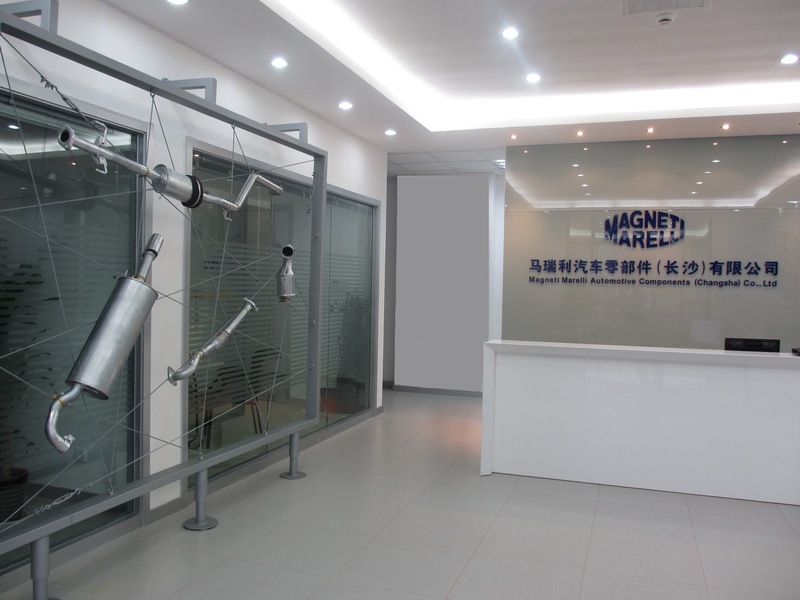 Home › Company › Sustainability › News Archive › New Magneti Marelli plant inaugurated in Changsha, China for the production of exhaust systems intended for GAC Fiat. In parallel with the official inauguration of the GAC Fiat plant, the production activities were officially kicked off at the new Magneti Marelli plant in Changsha, capital of the Hunan province. The new plant is dedicated to the supply of exhaust systems to GAC Fiat, the 50/50 joint venture between Fiat and GAC (China’s sixth largest manufacturer of automobiles, buses and industrial vehicles). The new facilities are located in the Supplier Park of GAC Fiat, in the Economic & Technical Development Zone of Changsha. The Magneti Marelli plant covers an area of 21,000 square meters, 10,000 of which are intended for production activities. At full capacity, the plant will employ 200 workers and will be able to produce up to 300,000 systems per year. The Changsha plant will be producing complete exhaust systems based on the know-how consolidated in the sector by Magneti Marelli, which set up a production base in China back in 2000 in order to serve local customers. The Changsha facilities will also supply the exhaust systems for the Fiat Viaggio on site, soon to be sold on the Chinese market. For this automobile, Magneti Marelli supplies other hi-tech components in the following areas: Lighting, Powertrain, Electronic Systems, Exhaust Systems and Suspension Systems. The supplied components include front headlamps with bi-halogen elliptic module, rear LED lights, Body Computer, instrument cluster, the Hands-Free Module with voice recognition for incoming/outgoing calls through Bluetooth connection, front and rear shock absorbers and components for the Dual Clutch transmission (hydraulic kit and electronic control unit) used for the 1.4 T-Jet 88 and 110 KW engine. For this engine, Magneti Marelli also supplies the Motorized Throttle Valve (ETC), the injectors and the intake manifold. We are happy to contribute to the start of the industrial initiative of the GAC Fiat JV in China – stated Eugenio Razelli, C.E.O. of Magneti Marelli – with a modern production plant that further expands our footprint in China, in a key sector for the automotive industry. In this initiative, we once again contribute the know-how and experience we have been acquiring on the Chinese market since 1996, through constant business growth, to the sectors where the company operates and to the offer of sophisticated technologies aimed at the local market. Magneti Marelli has been operating in China since 1996 with production plants and R&D/Engineering Centres in Shanghai (for Powertrain products and Exhaust Systems), Wuhu (Powertrain and Automotive Lighting products), Guangzhou (Electronic Systems), Hangzhou (shock absorbers in JV with Wanxiang Qianchao Company) and in the Chaoyang economic and industrial district of the city of Changchun (JV with FUDI for powertrain components).